Alright... so these are just regular, always-available Chocolate Fudge Pop-Tarts with a different colored frosting. Sound lame? It depends how you look at it. On one level, Kellogg's recycles a lot of existing Pop-Tarts varieties and sells them to us as something new. That is lame. Just yesterday, I reviewed their new Cherry Turnover Pop-Tarts which is their regular Frosted Cherry Pop-Tarts with less frosting. Earlier this year, they dressed their Strawberry Pop-Tart in crazy frosting and sold it to us as Wildlicious Wild! Strawberry Pop-Tarts. This product offers us another way to look at it. In short, it's Halloween baby! Pop-Tarts are fun. 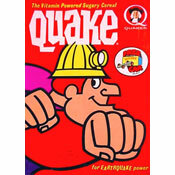 Loosen up, Mr Breakfast. 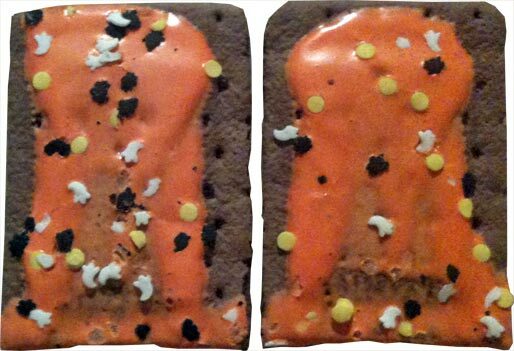 The only real spooky thing about Spookylicious Pop-Tarts is the frosting. I'd like to say it's the little sprinkles shaped like ghosts and spiders, but I really mean the way the frosting is misshapen and globbed on the actually product (see below). It doesn't look like the box. It looks the 1958 horror movie monster, The Blob. So the "spooky" part of "spookylicious" is there... but what about the "(de)licious"? It's a chocolate fudge pastry. Of course, it's kind of delicious. If you like chocolate and you like Pop-Tarts, it's frighteningly delicious or "frightlicious". I wish this was a unique new Pop-Tart. Last year, they did it right. They gave us Pumpkin Pie Pop-Tarts. It celebrated the season. It was new and it was great. As the winter holidays approach, we might see Gingerbread Pop-Tarts in the aisles again. For now, it's Halloween and we've got this. If someone asks you to celebrate a holiday with them, you can't say no. So by God, I'm eating this Pop-Tart. And by stars, tomorrow I'm eating... oatmeal, because these things really aren't very healthy. 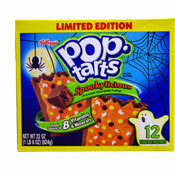 Nutritional Concerns: Each single toaster pastry has 200 calories, 5 grams of fat (1.5 saturated and 0 trans), 37 grams total carbs, 1 gram dietary fiber, 3 grams protein and a spookylicious 18 grams of sugar. Our rating for this product is based on what we would have given original Chocolate Fudge Pop-Tarts. 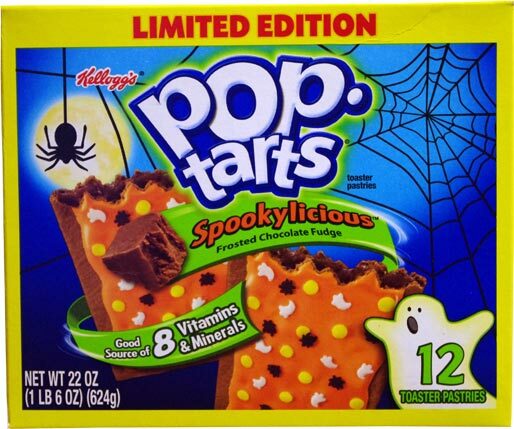 What do you think of Spookylicious Pop-Tarts? I got some and it looked like mold but not sure if it was white frosting or spiderweb effect? Can anyone clarify cause I'm scared to eat them. HAHAHA... that was funny man. You need to try Pumpkin Pie Pop-Tarts... OMG they are so good. Everyone in our family took a bite an we all said "wow".